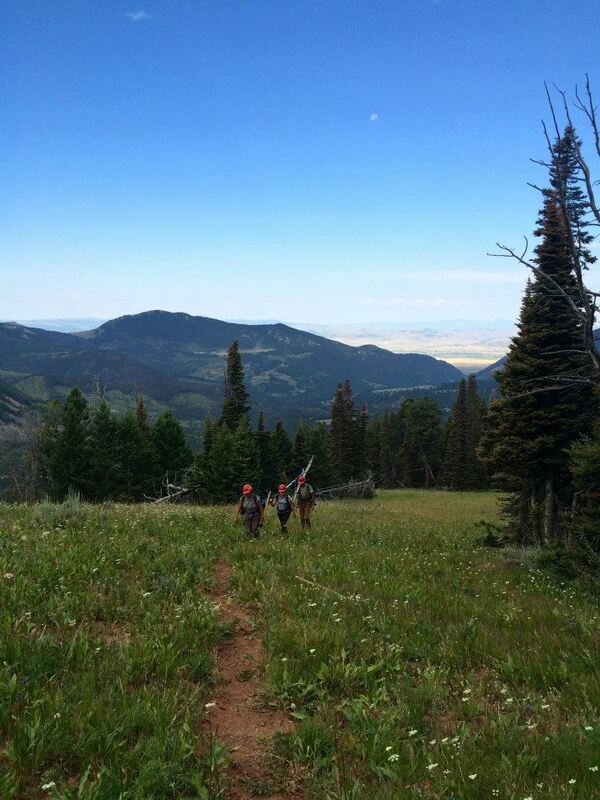 by Jenna Tegtmeyer It's the second week of projects and our team heads out to the project site with the idea that the hike into May Creek cabin would only be a mile. Little did we know the adventure we were in for. Thinking it would be a short distance and relatively flat trail, we decided we didn't need to pack lightly and that we would hike in a large cooler full of food. We park the truck and load up all our gear, cubies, equipment, and that cooler. We start off our hike in good spirits, anticipating our arrival at the cabin, after all it was nearing supper time. We get a ways on the trail and realize just how much stuff we brought with us..good thing it's only a mile and we should be there soon. As the time continues to pass, gear becomes heavier and the sun begins to set. Looking at my watch, I realize how long it has been since we left the truck. Hm...we HAVE to be close to a mile by now. We start to question the validity of our map and wonder just how far it really is to the cabin from the campground parking. The only sign we saw indicating the cabin was in this direction was at the start of the trail. Darkness is beginning to set in and we all begin to worry about missing the path that leads to the cabin. It's a new trail to the entire team so none of us know what we are looking for. The sun has set and now it's completely dark, the nervousness begins to set in we all grab our headlamps hoping we haven't somehow passed the cabin. The team is tired, hungry, and nervous. Brianne and Brittany begin singing at the top of their lungs. Jake and I are bringing up the rear carrying that darn cooler, when he looks at me and says, "If there's a bear out there, we're the first to go. We've got the food." The reality that we could be lost in the woods and carrying a cooler full of food hits me. I start to wonder what we will do if we don't find the cabin soon and when we will call it quits and head back. The weight is beginning to wear on me, Jake and I start taking more frequent breaks. I'm starting to think what our best option will be: continue on, but what if we passed the cabin; turn back, but what if it just up the path; can we somehow camp, we didn't pack for a spikeout? Then I hear Brianne, "It's a sign that says cabin with an arrow." Thank God, I'm thinking. The rest of the path was a series of Brianne and Lindsay yelling back to us, sketchy bridge. By bridge they meant a piece of plywood across a stream crossing. Again I'm starting to think, how much further and then I hear "Cabin!". The relief sets in for all of us and we can all finally breathe. It turns out, that mile of trail to the cabin was actually three miles. We all ate some delicious chili and slept well in our cozy cabin. Although in the moment I was scared and worried about the safety of our team, the experience was a great bonding experience. I know I can rely on my team when needed and we have a story of the strength and perseverance of each individual on our team. I'm thankful for the experience, it helped to easily break barriers and work together to reach our destination. The longest mile resulted in lasting friendships and cherished memories. ~~ A man was walking along a deserted beach at sunset. As he walked he could see a young boy in the distance, as he drew nearer he noticed that the boy kept bending down, picking something up and throwing it into the water. Time and again he kept hurling things into the ocean. The proverb tells the inspirational story of a boy wise beyond his years. For a long time I kept this lesson dear to my heart and found it applicable in many difficult situations I experienced… However, I found that this wise proverb fails to acknowledge the difficulty identifying those who need help the most. During our time in South Carolina I experienced it first hand - the homeowners who are loud and know how to "work the system" get help, while those uneducated, quiet and often too proudly independent fall through the cracks. The disparity is exasperated by the underlying poverty-related issues prevalent across the hardest hit areas. It often seems that the system disproportionately fails to meet the needs of the impoverished — a truth that is both overwhelming and frustrating for me to accept. Then again, after a few deep breathes, I accept that we cannot change the greater system in place and larger systemic issues arising from things out of our control. Rather than worrying about the disparity, we can use that energy for EMPOWERMENT and CAPACITY BUILDING. This is where our role as Voluntary Agency Liaison Support and Fast Track (Crisis Cleanup) Task Force plays a significant role in making an impact on the ground here in South Carolina. AmeriCorps St. Louis's main Mission Assignment goal was to assist FEMA and the SCVOAD promote Crisis Cleanup as a standard for all agencies/partners involved in the repair, rebuild, and recovery. The pre-existing Crisis Cleanup online platform offers an open source, user-friendly platform for voluntary agencies to identify home repair/rebuild needs and avoid duplication of efforts. While this tool has been utilized in past disaster efforts, its implementation in SC differs in that (a) it is normally used only during the response phase for muck outs and debris removal and (b) not all agencies actively use it creating disconnected databases of information. Over the past two months ACSTL along with CCMI developed and implemented a scalable model and best practices guide for the implementation of Crisis Cleanup in Long Term Recovery. This model, internally dubbed “Fast Track," actively promotes cooperation, communication, coordination, and collaboration. When coupled with with proper resources (particularly funding and/or donations in kind) and open lines of communication between FEMA, Voluntary Agencies and Homeowners, Fast Track can have a profound effect on bridging the disaster response and long term recovery phases. It model sounds idealistic… and it fact it was. Many obstacles came our way from all angles. Instead of accepting defeat, our team adapted. And with each lesson and various partner feedback, we continually adapted the model to it’s current form. The reality is that it may not capture every single need, however it is a start. I am proud to say that the SC Voluntary Organizations Active in Disaster (SCVOAD) ratified the model and many organizations plan to utilize the database. Furthermore, VOADs in other disasters are looking to utilize the system in their response and recovery efforts. by Jon Falk Kenan, Tiara and I have been in South Carolina for 2 months now. It's odd to think about but the majority of time I have spent in ERT, has been spent working the flooding. As it it's quickly coming to a close you begin to start thinking about what awaits you over the next horizon, what the next project will have in store for you. But I think it's important to reflect on what you have done and accomplished already. I can tell you that as a team, we have done so very much that can never be fully explained on paper or in a few short breaths. You ask me what we worked on while we were here? I'll ask you how much time you have. I don't think we will ever be truly able to describe the midnight emails or the heart-wrenching homeowner phone calls or the glory of organizing something only to have it torn down, to only have it rebuilt. How much time would it take to explain the bureaucracy of what we did or how many documents we produced? We built a program, how many people can really say they created a process to help in this world? The point is we will never have to explain that though, because our work here helped people who will never know our names. The process we built will be replicated and our documentation will go uncredited but it will serve it purpose in helping to rebuilt homes after disasters. I feel like we really made a difference here in South Carolina and I think we achieved the rebuilding that we set out to do 2 months ago. Kenan, Tiara and I will merely be ghosts in a week, as our cubicles will be empty and others will take our places, but our work here will stand the test of time, and weather the storm if you will. So here's to the LTRGs and the Fast Track process, to the Voluntary Agency outreaches and the the all night drafting sessions, to all the things we put our hearts and souls into for South Carolina, we enjoyed it all and I know we helped rebuild. The experience was amazing and I know that whatever the next event maybe, we can handle it as a team. Cheers. by Alex Stradal While it was unfortunate to be called in to respond to a disaster during our winter break, it was ultimately a very formative experience. Officials were calling for the flood to be on par with the flood of 1993, and by all accounts of the residents in Fenton and Arnold, it was. The first day was a whirlwind of events wherein we set up a VRC in Fenton, then dispatched half the team to Arnold to assess the damages there. It was a very long day, but was very rewarding to know that we most likely saved a family’s house from ruin. Yesterday, the 30th was, for me, an even more rewarding day. Tasked with scouting the area for families in need I came across a family working alone. I asked if they needed help and the father said that they sure did: he had a broken wrist and two cracked ribs, his wife was tiring quickly, while his son was also in physical distress with a thrown out back. I told the family I would be back in a few hours with more people; they were elated. One of the volunteers I came back with had an engineering degree and was an expert at building walls, while all the others were eager to get to work. Soon our numbers swelled to twelve volunteers as neighbors came out to help of their own volition. In a matter of four hours we made 2200 sandbags and constructed a formidable wall. I left their property at eight o’clock and headed back to the VRC for pack out and was hoping that this wall would actually work out for them. By Max Prieto Trying to wipe out bush honeysuckle from the face of the earth can be a daunting task. Even equipped with chainsaws and potent chemicals all work can seem futile. The invasion has no end in sight.That is why the best way to overcome the feelings of hopelessness is to somehow make it fun and enjoyable! That is exactly what our Team Leader Sarah accomplished! Through a series of games (including fun pranks and "friends vs foes") we all had a great time working hard! Almost two years ago I traveled to the Spanish Peaks Trail in Ennis, MT for my first project with ERT. I knew almost nothing about how the program worked, what to expect, how to saw, how to build trail, or what an invasive plant was. All I knew was how to follow the leadership team into the woods and do what they asked of me. Last week I went back to Spanish Peaks Trail. My second year with the program is almost over and being back at the place where it all started made me realize how much I have learned. The moment we learned we were going to reroute the trail I knew exactly what tools to grab, how to scratch in the trail, and how to build water features. I began to think of the other hard skills I have learned- how to fell a snag, how to double bit ax through a log, how to mix chemical, how to change the oil in a truck, how to put up facia on a building, how to muck and gut a home. The skills I am leaving this program with are too many to count. More importantly, I learned how to be a better friend and teammate, how to lead a group of my peers, how to be flexible in ever changing conditions. I became a more outgoing and capable person. And I made some of the best friends I will ever have. Looking back at that first week at Spanish Peaks it is hard to believe how much I have changed and how much I have gained serving with the ERT. by Carolyn Stephen It's not often that we get to interact with the people who live in the communities in which we work. Usually we are off in the woods in the middle of a conservation area or a state park and people besides ourselves and our contacts are few and far between. However, this last week my team was spraying for the pesky invasive Spotted Knapweed on a couple of state highways. Passing cars are not uncommon, and every so often someone will stop to ask what we are spraying for. One couple in particular stood out to me. We first met J- (I just remember her name started with a J), the wife. She pulled her SUV over to the side of the road, hopped out of her car, and eagerly crossed the road. When we told her we were spraying for Spotted Knapweed, she was absolutely elated. I don't think I have ever seen anyone quite so grateful for the service we do. She told us how she and her husband had been fighting Spotted Knapweed for years now on their property, and how happy she was to see MDC and MODOT working to eliminate the invasive plant. Two hours late for work, she could not stay long, but her enthusiasm lightened our day, as she told us that she was going to call her husband immediately and tell him to stop by later. And off she drove. We returned to our spraying up the roadside, when, about five minutes later, a man pulled up and climbed out of his vehicle, introducing himself as Julius. I thought he was just another person ready to ask questions, but it turned out that this woman's husband really was very eager to come talk to us, so there he was. He must have dropped whatever he was doing to come inspect our work as invasive sprayers. Like his wife, he was thrilled to hear that we were spraying Knapweed and proceeded to give us a list of roads that had some particularly bad infestations. After discussing the issue for some time with us, he walked along the road with me and another member as he headed back to his car. He helped us identify the plant on the walk, picking up roadside trash as we went. I was very impressed by this man's dedication to something that most people know very little about. It meant a lot to hear that someone from the community really cared about what we were doing, and took the time to walk down the road with us a little ways, even help us out in his own way. After speaking with him, I valued my own work a lot more, and felt a taste of the impact we might be having. The sound of 0600. It's the first day back in service since I have returned home from Detroit nearly two weeks ago. Even though we are getting into the thick of the coldest time of the year, I'm excited to be at it again. Mornings are rough; so are morning temps in the single digits when you know that within the next hour you'll be out of that nice cozy sleeping bag and into a woodland area completing the tasks needed to meet the day's objectives. And though a part of me longs to lay back in bed, I know I will regret not ever getting up and doing something fulfilling with my day. This is what ERT is all about. This is what ultimately gets me out of bed in the morning, and, for that, I am grateful. A few months ago ERT members completed their pack test. Carrying 45lbs. on their backs for 3 miles in under 45 minutes. I was impressed and so proud of my team. The day of the pack test was exciting for everyone. We made plans to relax with breakfast and mimosas after. I began along with everyone else and quickly made my way to the end. After my first lap, I remember Sara telling me that I needed to move faster to stay on track. My music was not fast enough. I was not fast enough. I pushed and started to feel a very familiar pain. My shins became stiff. My teammates passed me as if I was the checkpoint. I couldn't continue. I had to remove my pack. I knew that I could try again but that fear haunted me for months. Whenever we hiked or went on a long walk, I was always behind. I feared that I was not qualified for this task. I didn't feel like a member of ERT. I didn't belong. It took me longer to not only hike up hills but down as well. I pushed myself to prove that I was qualified but in the back of my mind, I never thought that I was. When Sara announced that we would be taking the pack test again, my heart dropped. I had no idea what to expect. I had been working so hard ever since the last test but I was still terrified. The thought of failing again left me petrified. I started working out and stretching again. I knew my shin splints wouldn't be so bad if I stretched my legs enough. Maybe. "You're doing great, you have only two laps left!" My jaw dropped and rose instantly into the greatest smile I could ever make. I felt amazing! I could have done another 8 laps. As much as I felt like dropping to the floor in the first two laps, I was so happy. I pushed and pushed. Scott stood by my side distracting me from any doubts that could possibly come. I crouched down and sped up around the curves. I focused on my breathing. I smiled every time I saw the rest of my team standing at the finish line smiling for me. They cheered and encouraged me more than I could have imagine. They all came just to support us. Placing my pack on the ground meant letting go of more than just 45lbs. I dropped any negative thoughts that had festered since the last test. I walked an extra lap smiling so wide, my cheeks started to hurt. At that moment, I realized something that I will never forget. Endurance can't be measured. We set out to achieve new goals because everything unfamiliar is a goal to achieve. Passing the pack test did not make mountains any flatter. It didn't make blowers more enjoyable to carry all day. It sure as hell never kept the rocks in place when scaling down a steep hill. So why did I think I could measure my strength the way others who do not know me would? We hold more inside than what we could ever carry. by: Chris Stauffer We have come full circle. Today as we were driving out of our campsite I realized why the area seemed familiar: the campground was the final mile of Quest for my team. Fond memories ensued after that epiphany and the good times carried on throughout the day. There was one point that we had to hike out of the woods to avoid a thunderstorm and we managed to do so without getting so much as a drop on us. Don’t worry, Mother Nature made sure we got our dues. After returning to work on the trail for the remainder of the day we were caught in a sudden downpour. All of us were soaked through in a matter of seconds because of the surprise attack. Most of the trail before our maintenance site turned into a moat to complicate our return, but we overcame the obstacle with ease. That seems to always be the end of our stories with AmeriCorps: we overcame. There are always unexpected obstacles and detours, but in the end the Emergency Response Team finds a way to get things done. Many of us entered these woods long ago with little knowledge of the service that was expected of us and we are all emerging as experienced leaders in the field of nature conservation. While I was not among those sent off on disaster relief, I feel that the spontaneity of our program has armed each and every one of us with problem solving skills that will make the transition to that profession, or really any career choice, that much easier. We started this year together and we will end it the same way--there are not many jobs that can claim that sort of retention. I feel like that is what made this year such an amazing experience. Through thick and thin we stuck together and that camaraderie, I believe, is what drives AmeriCorps St. Louis to success. Thank you one and all for the memories. We came, we saw, we conquered... we overcame. by Chris Stauffer Average snake sightings a day? 3! Today Sean and I saw 4—2 milk snakes, a rat snake, and a copperhead. I’m becoming more and more paranoid walking through the brush around these highways, like, at any minute a wild creature will appear and I’m not talking about an adorable pokemon. The hills are riddled with holes and every time the wind blows the tall grass makes a hissing sound. I think infrared goggles should become part of our PPE… regardless, we’re doing good things. It’s hard to realize the impact of our work at times. When I signed up for the Emergency Response Team I was thinking I’d be doing a lot more with disasters; thankfully this year has been relatively calm, but this means we have been primarily taking on Nature Conservation projects. These projects can get tedious to the point that it is hard to feel like we are making any sort of difference…but then there are always moments that remind us otherwise. Just the other day we went out for pizza and there was a youth there that was fascinated by what we did. Fighting fires, helping out with disasters, even spraying along the highway—we are constantly doing hazardous work to make this world a better place. As we were making our way to the truck to return to our housing the kid ran out to us and shook my hand. All I had been doing for the past 2 months was spraying invasives and still this youth thought of me as a hero. That moment meant the world to me—that moment made the months of spraying the endless hordes of invasive plants worthwhile. Thanks kid; our work isn’t always glorious, but when we run into people like you it makes serving our country infinitely better. by Liana Kopp Earlier this month I had the privilege of responding to the tornado that swept through Baxter Springs, Kansas. Our original purpose in Baxter Springs was to assist the Red Cross in the operation of the Multi-Agency Resource Center (MARC). In practice, this meant greeting affected homeowners as they entered the MARC and leading them from organization to organization to make sure they received the help that they needed. Many of these homeowners opened up and told me their stories, allowing a glimpse at the trauma they had so recently experienced. During the four days I spent in the MARC, I began to recognize homeowners and they began to recognize me and my fellow ACSTL members as volunteers who genuinely wanted to help them find the services they needed. My team then moved to the Volunteer Reception Center (VRC) where we took over for the local women who were running it so that they could go back to their jobs and lives. While there, we talked with homeowners to find out what kind of volunteer work they needed done and then we sent our volunteers to those sites. As with the MARC, homeowners would come into the VRC without knowing what the process was or what to expect from us. However, on several occasions, we watched as homeowners would walk through the door tense and confused until they saw those of us they had worked with in the MARC. You could see through their body language and facial expressions that as soon as they saw ERT members they recognized that they felt more comfortable asking for help. One woman who stood out the most for us was a woman we met at the MARC. She and her husband and their five young children tried to run for the basement when the tornado hit but the stair collapsed and they were unable to make it. Instead they had to cling to one another in the interior of the house to prevent the children from being sucked away. Little did they know that the stair collapse was a blessing because the basement flooded and they all would have drowned. We saw her in the MARC several times and were there to listen to her story and do what we could to match her with the help she needed. The day after we took over the VRC the same woman walked in looking around a bit bewildered. But as soon as she saw my teammate Zoe and I, she relaxed and came right to us to request the tools she needed and told us how the cleanup process was going. It was a gift to us to be let into her life like that and I think we provided a service just by being familiar faces to make her recovery a tiny bit less overwhelming. By serving in the MARC and the VRC we were able to help homeowners through the initial stages of response and recovery. We made the process more understandable and they became more comfortable talking to us because of that. It is an experience I will never forget in a town I grew to love in the one short week we were there. The extent to which citizens in this country get involved with national service is somewhat underestimated. More people do their share to serve our country than one would expect. I discovered this first hand last week while doing a supply pickup for my team at the Cassville Walmart. As we were exiting the store, an elderly couple approached us and began to comment on our A’s. People regularly ask us what the A represents, or what organization we are a part of. My first assumption was that this woman and her husband wanted to know what the A’s were, but before I could begin to answer, her husband pulled back a flap on her jacket, showing off two AmeriCorps Vista pins that she had been wearing. I was shocked and simultaneously overwhelmed with joy to meet this elderly woman, who had served just like me. My team began to converse with her as she told us stories from her time serving with AmeriCorps Vista. Our conversation was short and sweet, but I could surely tell that her time serving had a strong and lasting impact on her. To this day, years after her service, she still goes out to town with an A on. We said our goodbyes and parted ways, but still, the interaction feels a bit surreal. It was nothing short of great. One day when I’m an old man, I hope to spot a group of young adults sporting A’s in a rural grocery store. I’ll go up to them and flash an AmeriCorps pin if I’m lucky enough to hold onto one for that long. I’ll tell them about the women I saw with an A in the Walmart all those years ago. I figure it’ll make a good story. Maybe even a great story. In order to tell my great story for April, I have to start by going back in time several months. Back to October and November, where I, like so many ERT members before me spent several bone-chillingly cold weeks trudging through knee-high snow, up some of the steepest longest hills in Missouri, climbing waterfalls, and forging rivers, all to clear perhaps one of the most challenging firelines in all ERT history. For years ERT members have been hiking, sawing, blowing, clearing and re-clearing these miles of track that is the Taum Sauk Mountain State Park burn unit fireline. Then, fast forward in time to the fateful day of April 16, when my team leader got the same call that so many teams have gotten before us, they were ready to burn Taum Sauk and our team was on stand-by. As I mentioned earlier, we have not been the first team that has been told they were going to help burn Taum Sauk. Many teams before us have been told this, and many teams have packed up their gear and arrived at Taum Sauk ready to burn, but zero teams have ever actually burned this illusive unit, for at least the last 15 years, anyway. So we decided not to get our hopes up yet, even as we drove back to St. Louis to pick up another team member and of course, Bruce Bailey, and even as we drove to Taum Sauk, early in the morning of April 17th, and even as we drove into the park to meet up with the rest of the burn crew. It wasn't until we were going over the JHA and the burn plan that I allowed myself to believe that we were actually going to burn Taum Sauk burn unit. And WE DID!, and it was glorious. Although the hike was intense, and my main job was suppression operations (i.e. holding line; which we all know is not the most exciting of the prescribe burn jobs) and we only burned the north half of the unit, it was still an epic day and so satisfying. I am so happy I got to be a part of this burn that so many of my fellow ERT members, and so many Alumni before me have helped to prepare. I wish they all could have been there to help out with the burn. But I think how flawlessly the burn went is a testament to all of the hard work every one of them has done to make such a secure fireline. And I dedicate this great story to every ERT member who has worked on Taum Sauk, and who has helped to make this burn possible. UPDATE 6/1 Our Members are once again on the ground in Clarksville assisting with flood mitigation efforts. Please stay tuned for updates. During the week of April 14th, 2013 heavy rainfall and melting precipitation threatened many parts of the Country, in particular, the Midwest. As the Mississippi river began to rise the Missouri State Emergency Management Agency (SEMA) called upon AmeriCorps St. Louis (ACSTL) to travel to Clarksville, Missouri to assist in the flood fight. On Wednesday April 17th, 25 Members of the ACSTL Emergency Response Team deployed to the northeastern Missouri town of Clarksville, whereupon they immediately began constructing floodwalls, sandbagging, and establishing a volunteer reception center (VRC). Since their arrival, ACSTL Members have been serving around the clock through a unified command with City leaders and members of the Missouri National Guard. Additional partnerships include Convoy of Hope who, with support from the Army Corps of Engineers, delivered 275,000 sandbags and multiple pallets of flood fight plastic; the Red Cross who delivered food prepared by the Southern Baptist Disaster Relief Organization, which was then delivered to flood workers by the local Methodist church; local prison inmates, who have assisted in sandbagging and were a vital resource in combating the flood waters; the local Food Bank, who contributed supplies and bottled water for flood workers; and local farmers and contractors who contributed machinery and man power, which greatly assisted in the construction of the emergency levee system. To date, the ACSTL Volunteer Reception Center has recorded over 450 registered volunteers. There are many folks I look forward to hosting in our shelter—Robyn is undoubtedly one of them. If she’s not in, I ask about her, and when she is, I make sure she’s comfortable and at home. She’s a tiny woman with a loud laugh and a great sense of humor—a guest I’m truly going to miss. In brief, Robyn is a St. Louis native who, at her age, struggles to find work. The streets are not where she wants to be, but right now she’s stuck. Without hesitation Robyn states that she’s already worked her dream job, which is bartending. She’s a people person—customer service is her thing. She fears she is getting too old, however, and people don’t want that anymore. Kiener Plaza. It’s a nice place. She continues on by explaining her worries, which include where to sleep and where to eat, especially during inclement weather. Resources are scare and although some exist, you can’t get from point A to point B, especially if you are without transportation. Another thing is that there’s not a lot to do in the City and on the weekends there is nowhere to go [usual services such as the Bridge at Centenary are closed]. A lot of folks end up at Union Station. So where do you sleep? Lately, Larry Rice [New Life Evangelistic Center]. If you want to leave you’re locked out. They take your cigarettes too. So far, so good, but, you need to know how to treat people too. What should people know about homelessness? The homeless need more than just food and clothing. Regular folks take for granted toilet paper and hygiene products. And not all homeless people are on drugs or alcohol. There are a lot of smart people out here. Sometimes people get in a bad relationship or lose their jobs, companies merge. As far as getting a job goes, it seems most are by word of mouth and a lot don’t want to hire you when you’re homeless. They say you need reliable transportation. But you know, buses do run pretty good. People need to treat the homeless like humans and not like animals. Another thing a lot of people don’t think about is that there isn’t anywhere to put your stuff. You can’t go to a job interview carrying all of your clothes around. What do you see as a solution to homelessness? And although job creation would help, she doesn’t know how to solve homelessness. Some people don’t want to be off the streets. Some people like it because there aren’t any worries, particularly the young ones, although some old, too. How did you find out about the AmeriCorps St. Louis Shelter? And what about Winter Outreach? No experience with Winter Outreach yet. She did stay at the St. Teresa and Bridget shelter once though and loved it. She also enjoys the emergency shelter at 12th and Park. She would like to get a job. It’s hard to find one though. The library won’t let her get a card because she can’t provide a permanent address. A job, an apartment and a car. People can help by providing jobs and transportation. Let us show you what we got! In addition, access to showers, it is nice to be able to groom. "I appreciate that you guys take care of us," she says. On an unusually warm day in mid-February, I sat down with Timothy Swift, one of our regular shelter guests, to discuss homelessness. Swift, whose “home” translates to St. Louis streets and abandon buildings, is no stranger to homelessness. Now 53, he took to the streets in 2002 after a battle with drugs, alcohol, and family problems. “Things got misunderstood,” he says. During our very open and honest conversation, Swift revealed his ambitions, his concerns with homelessness, and his desire to overcome the lifestyle he currently lives. As it turns out, Swift went to school to be a salesman, though never worked in the field. Instead, he became a Porter for Purina vacuuming, stripping and shampooing floors. In addition, he once drove a dump truck and even worked for the City as a bus driver for the St. Louis Public Schools System. A fireman. That’s been an ambition since childhood. Lafayette and Park is a place where Swift can sit without being bothered and let his mind flow. He enjoys time to himself; it allows him to concentrate on what he is going to do to get out of his current situation, and talk with God. Normally, Swift gets by through churches. They help with clothing, food, and shelter, but he prefers not to go to their shelters. He doesn’t like living in them anymore. There are a lot of things you can learn from being homeless, he says. The main thing is that you must find resources to get shelter, food and clothing and keep your hygiene together. The rest falls into place, however, there isn’t much to do when you’re homeless. You sit around doing nothing all day trying to find something to do to stay out of trouble. Police harass the homeless a lot too. They tell you, “You can’t be here… you can’t be there.” They act like you live in a home and there is somewhere you can go. If there were somewhere you could go, you wouldn’t be here. “They [police] ain’t out chasing criminals, they’re chasing the homeless,” he says. Through it all, Swift takes ownership of his mishaps and turns his life over to God. Putting your life in God’s hands doesn’t necessarily mean going to church. For him, it’s about talking to God on your own everyday and letting him guide you. Mainly, anywhere, he says. In certain situations you end up in a vacant building. The worst is when it’s raining. Finding somewhere to cover up for shelter isn’t easy. Sometimes the bus stop is your only option and sometimes you fall asleep, but it really doesn’t matter if you fall asleep as long as you’re dry. The winters are definitely rough, too. Blankets are essential. It’s not safe. Let’s just say people will come and try to steal your stuff and even sneak up and inflict violent harm. Most of the people that will harm you aren’t even homeless. It’s incredibly dangerous living on the streets. People watch where you put your stuff, where you sleep. Luckily, when there’s a bunch of people around that’s a different story, they won’t mess with you. Being around enough people is a safety net. Homelessness is not a choice. “If I choose to be homeless that means I really don’t care about myself,” Swift says. Homelessness happens, it is something you can’t stop. You really don’t want to be homeless. It’s easy to get there but hard to get out of, and I know nobody really likes being homeless. It’s just one place you don’t want to be. Furthermore, not all homeless are pleasant people, especially when they are used to living a certain way and everything is swept from under their feet. It’s hard to depend on someone else when you are so used to doing things on your own. It’s not until you realize that some people care and want to help you that you start to accept it and shed those attitudes. Furthermore, sometimes people get so depressed about being homeless that they want to kill themselves––that’s the honest truth. It’s just not easy living on the streets. You don’t know where you’re going to eat or sleep and there’s no money to help. Through laughter Swift says, “If I could tell you that, I wouldn’t be in this situation.” Nonetheless, he sees rehab, housing, money management counseling and a job as necessary resources. All things that are not easy for someone to do on their own. One day some friends told him about it and ever since, here he is. He won’t go anywhere else. The people here are kind. It’s the best shelter, so far. You even get cereal, milk, juice, and coffee here. A couple times, while living in a junkyard, Winter Outreach came by with blankets, hot chocolate and soup. They even offered transportation to shelters, though it was denied. Right now Swift is a day-by-day person. Ultimately, he would like to get on disability (resulting from a debilitating car accident in the late 90’s), get himself into a rehab clinic and a housing program, or better yet, his own place. Unfortunately, work isn’t an option right now because of back problems and Swift fears that corrective surgery would leave him in a wheelchair. Plus, it’s hard to pay the doctor’s bills without money. One, be a millionaire­­­–and then help charities you can trust. Two, go to a shelter and drop off clothes, shoes and hygiene products. Three, wish that my friends can do the same. Swift suggests figuring out peoples clothing needs, mainly kids, and helping to supply them. More importantly, people can figure out how to get kids off the street. They didn’t ask to come into this world, it’s not their fault they are on the streets. "Nope," he says, "brain is going dead with age." Continuing on, "It’s hard to think clearly when you’re living on the streets. Your mind gets warped. You keep thinking about how to get off the streets. It’s one thing knowing how to survive, but the question is how to get off the streets." From the end of September to the end of October, all of our new Emergency Response Team members, in addition to a few second years, nestled in to the grind the Montana way. This was the 12th year the AmeriCorps St. Louis ERT has partnered with the Beaverhead-Deerlodge National Forest in western Montana and the results have been tremendous. ERT Members spent the month improving recreational trails, planting trees, maintaining campgrounds, removing hazard trees, building and repairing fence and splitting lots and lots of firewood. The new members were tested through demanding physical labor and primitive living conditions. They showed their resilience as temperatures dipped below freezing for a good portion of the month. They came together as a team quickly and had a great time getting things done! 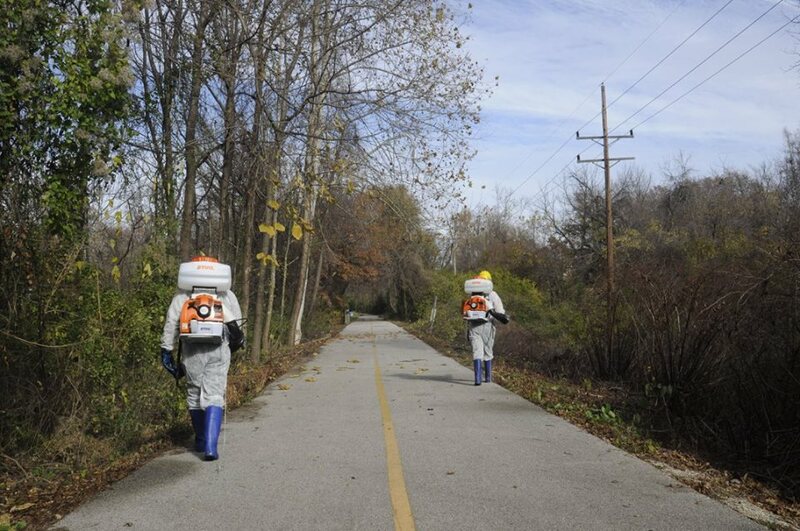 By the time the team was ready to make the long journey back to St. Louis they had cleared and maintained almost 30 miles of trail, built around 3,000 feet of new fence, fell 500 hazard trees and served over 4,000 hours! On September 30th, nine members of our Emergency Response Team headed south to Oregon County, MO where they embarked upon a unique project to help protect local bat habitat. During this 10 day project members built “bat friendly” steel gates across two entrances to Oregon County Bat Cave. The gates allow Bats to travel to and from their homes safely while preventing human intrusion. A human introduced threat to the Bat community, White Nose Syndrome, is on the rise and without such habitat intervention the Bat population is likely to drop drastically. To construct the gates AmeriCorps St. Louis Members cut, hauled, and hoisted heavy steel beams and then anchored them into place. The work was difficult, but rewarding. By the end of the project the crew had completed gates at both cave entrances. The gates will help insure that Oregon County Bat Cave, a critical resource, will be protected for generations to come. Oregon County Bat Cave is over 1,400 ft long and researchers speculate that a mature colony of over 100,000 threatened gray bats use the cave for winter hibernation. 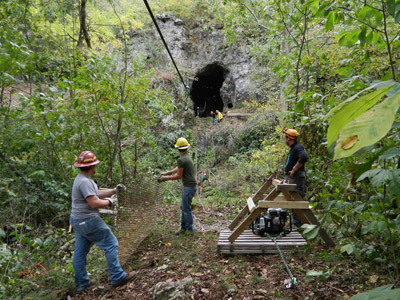 Our team worked closely with the Cave Research Foundation and the US Forest Service during the construction process. The Cave Research Foundation has installed dozens of similar “bat friendly” gates across the country.